Working out several days a week, my clothes can sometimes get a little bit extra… funky smelling by the time they get to the washing machine. 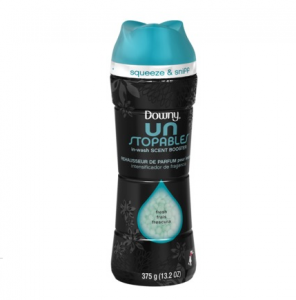 I’m totally into using Downy Unstopables now when I do my wash. Seriously you guys, I LOVE the smell of this. Sometimes I just open the cap of the container and give it a whiff just to enjoy the smell. I use the “Fresh” scent, and it has such a clean, crisp smell. Fits perfectly in a stocking – great for Mom! Get Downy Unstopables on Target.com for $6.99 or in your local grocery store! Disclaimer: Downy Unstopables was a sponsor of one of the Mommies with Style Gift Guides. As always, all thoughts and opinions are my own. « Holiday Gift Boxes from PACT – Love These Fun Socks!